Springfield Heights Mennonite Church, July 2017. The Springfield Heights congregation in Winnipeg, MB began services and formally organized in 1964. The first building was occupied in 1965, with a subsequent building program in 1978. Bruno Enss is considered the founding leader of the group. The congregation originated through division from North Kildonan Mennonite due to the latter's size and the desire of some to use the German language. By the end of 1965 the membership was already 307 with increasing transfers from other Mennonite congregations in Winnipeg and continuing immigration from South America. Canadian Mennonite (23 March 1965): 1. Springfield Heights Mennonitengemeinde, Winnipeg, Manitoba 1971. Winnipeg: Springfield Heights Mennoniten Gemeinde, 1971, 52 p.
Fast, Karl, ed. Fiftieth Anniversary of the Mennonite Settlement in North Kildonan. Winnipeg: The Anniversary Committee, 1978, 128 p.
Hiebert, Angi. "The History of the Unique Separation of the Douglas Mennonite Church from the Springfield Mennoniten Gemeinde (1976-1982)." Research paper, Canadian Mennonite Bible College, 1983, Mennonite Heritage Centre. Epp, Marlene. "Springfield Heights Mennonite Church (Winnipeg, Manitoba, Canada)." Global Anabaptist Mennonite Encyclopedia Online. September 1986. Web. 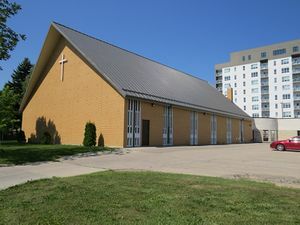 22 Apr 2019. http://gameo.org/index.php?title=Springfield_Heights_Mennonite_Church_(Winnipeg,_Manitoba,_Canada)&oldid=153806. Epp, Marlene. (September 1986). Springfield Heights Mennonite Church (Winnipeg, Manitoba, Canada). Global Anabaptist Mennonite Encyclopedia Online. Retrieved 22 April 2019, from http://gameo.org/index.php?title=Springfield_Heights_Mennonite_Church_(Winnipeg,_Manitoba,_Canada)&oldid=153806. This page was last modified on 30 July 2017, at 03:10.